On July 15, 1954, a meeting was held at the Little Brown Church in Sharp Park. At this informal meeting it was decided to have a get-together party of Master Masons, living in the Coastside Area, on July 22, 1954 to further discuss the forming of a Masonic Club with the ultimate aim of forming a Masonic Lodge of F&AM. 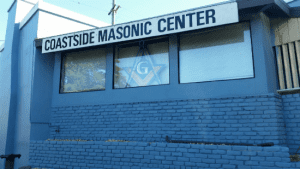 On August 5, 1954 another meeting was held and the club elected William McKnight Vice Chairman when the name Coastside Masonic Club was established. On September 2, 1954, President & Club Chairman Reed Richards resigned and John Perazzo was unanimously elected President and William McKnight was elected Vice President. On October 21, 1954, the building Committee reported that the Old San Pedro School building in Sharp Park was available and suitable for a Masonic Temple. Almost a year later on December 1, 1955: notice of intention to form a Masonic Temple in Sharp Park was prepared and sent to the Grand Lodge of California. On May 9, 1956, Coastside Temple F&AM was instituted by Edgar Stewart, Jr., Grand Master of California. In 1957, the city known as Pacifica was incorporated.